Radquote is a functional part of Radmanager module that enables you to quickly and easily create quotes for sheet metal parts and purchased parts. It gives you a full breakdown of the costs and allows you to alter each cost area to give you the flexibility you need when negotiating. Flexible reporting allows you to send professional quotation letters and emails, and make internal reports for analysis. Radquote comes with a standard set of cost calculations for operations like: material consumption; laser cutting; punching; bending, welding, painting, sub-contracting and assembly. These operations can be customized and new operations added to meet your requirements. Quote level operations, such as analysis and transport cost, are also included. Radquote gives you a full breakdown of where your costs come from, so that you can see what areas most affect the cost. During negotiations you can quickly adjust your margins and override the calculations to achieve your selling price while maintaining control of your costs. Radquote uses a powerful reporting engine to produce professional reports and letters. Radquote comes with a set of standard letters which can be quickly customized to include your company logo and details. You can also add your own layouts and reports. Radquote uses RADAN’s extensive knowledge to perform specialist cost calculations for cutting and bending operations. Cycle times and material usage are calculated using RADAN’s CAM engines, whereas handling times and costs can be calculated using either a CAM engine or a database of empirically determined settings and calculation methods, taking into account the parts’ complexity, size and weight. Using the power of the RADAN suite of products makes Radquote a unique, fast and very accurate way to issue, in a few clicks, the quotes you need to grow your business. When negotiating quotes you need to have an accurate view of your costs so that you can be competitive without losing money. You can use RADAN’s 2D and 3D CAD/CAM to create accurate geometry for calculating parameters like profile lengths and part areas. 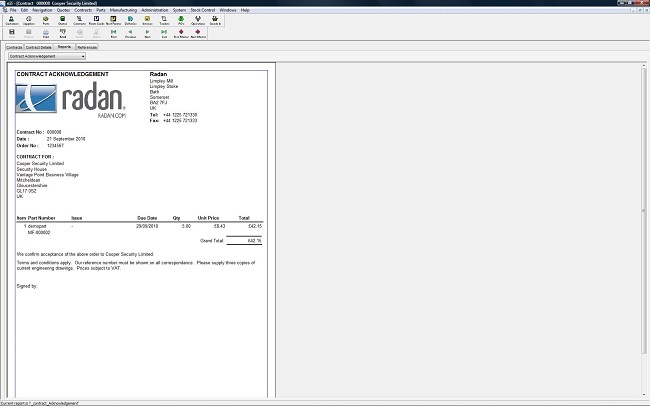 RADAN parts can be nested to get accurate sheet utilization and apportion scrap to per-part material costs. RADAN tooling can be used to get accurate cutting times and tooling costs. Radquote utilizes all this information to give you better control over your margins. eQuote has been developed specifically for the sheet metal industry by RADAN for the fast efficient quoting of sheet metal parts and assemblies. For most sheet working companies, the work preparation of parts for nesting is very time-consuming. Using the power of the RADAN suite of products makes Radquote a unique, fast and very accurate way to issue, in a few clicks, the quotes you need to grow your business.